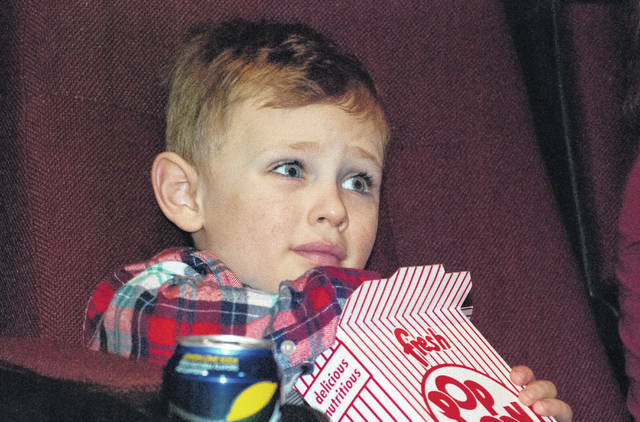 With his eyes open as wide as they could go, Linden Smieszek, 5, munched on some popcorn as he waited for “Peter Rabbit” to start Monday afternoon at the Strand Theatre. He said he was happy to be there for the movie. The local Big Brothers Big Sisters organization was treated to an afternoon at the movies by the Kiwanis Club of Delaware County Noon Club. The club worked in conjunction with Performance Chrysler Jeep Dodge Ram Delaware and Fidelity Federal Savings and Loan to fill the 235 seats of the main theatre for the special showing. Walters said this was the first time the club had sponsored an event of this type. He said the club reached out to all the Delaware schools in order to fill up the main theatre. Walters said if “Peter Rabbit” had not been running, the club would have had to “pay big money” to bring in a kids movie for the event. Walters said the club not only paid for all the seats, but also for popcorn, candy and soda pop for everyone that had reserved a seat. Walter said the club is already planning for next year’s afternoon at the movies event. He said the hope is to make it an annual event. Probably more excited than the kids was the Strand’s Managing Director Tracey Peyton, because she had a sold-out theatre. Peyton said the Kiwanis came to her a couple of weeks ago with Big Brothers Big Sisters and wanted to do something special for the kids. She told them about the kids movies that were coming out and “Peter Rabbit was the choice,” she said. Peyton said she has other events similar to the one Monday that will happen later in the year. This entry was tagged Big Brothers and Sisters, D. Anthony Botkin, Kiwanis, Peter Rabbit, Strand Theatre. Bookmark the permalink.